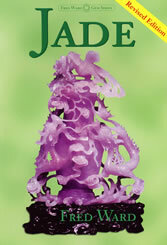 Fred Ward introduces you to the minerals jadeite and nephrite that together are known as "jade." Lots of great photos. Over 5000 years ago, ancient people selected jade because of its toughness to manufacture tools that were "high tech" for their day. He traces its history of how independently, in many parts of the world, jade was selected and fashioned into revered gems. He also gives advice on how to purchase jade art and jade jewelry and how to properly care for them. Jade is one of the most interesting stories in gemology. This book is a 6" x 9" paperback with 64 pages. Revised edition. From the Fred Ward Gem Book Series.